Alison Shaffer: Add some pink to your ride with Auto Tex Pink wiper blades for your windshield. Add some pink to your ride with Auto Tex Pink wiper blades for your windshield. Wipe away a rainy day with the color pink. Pink wiper blades that it! Your purchase helps make donations to the National Breast Cancer Foundation in the USA and the Breast Cancer society of Canada for sales in Canada. AutoTex has committed to donate a portion of the sales from wiper sales to the National Breast Cancer Foundation (NBCF). Paula Lombard, a 20-year wiper industry veteran, has taken “making a difference in people’s lives” to the next level by creating AutoTex Pink Wiper Blades. 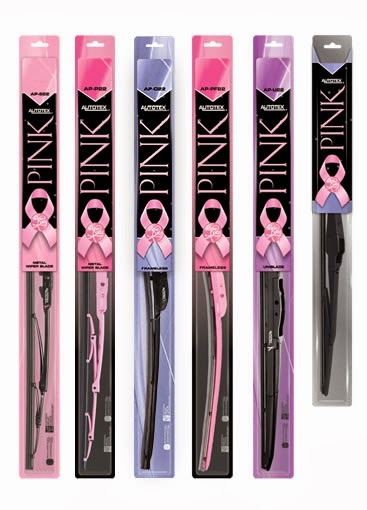 For every wiper blade purchased, AutoTex PINK proudly makes a donation to the National Breast Cancer Foundation for sales made in the US and the Breast Cancer Society of Canada for sales made in Canada. The simple act of changing your wiper blades can change a life. The NBCF fulfills its mission to save lives through early detection and provide mammograms to those in need by increasing awareness through education, providing diagnostic breast care services for those in need, and providing nurturing support services. When breast cancer is detected early, relative survival rate is 98 percent. Disclosure: I received a sample of Auto Tex Pink wiper Blades for this post. The comments and views are my own.